Scrap Metal Removal; Pick Up & Recycling | 1800-GOT-JUNK? Chances are, at least some of your old rubbish has metal components. Scrap metal from renovation projects, car repairs, and other items containing metal shouldn’t just be thrown away with the rubbish. Metal is a valuable resource that can be recycled and turned into something new. 1-800-GOT-JUNK? offers scrap metal pick up from your home or business, so scrap the pain of hauling your metal with us today! We are fully insured and do all the heavy loading and lifting so you don‘t have to. For peace of mind, your scrap metal will be recycled where possible. 1-800-GOT-JUNK? is the world’s largest and most trusted rubbish removal company, providing high quality rubbish removal since 1989. With our experience and reliability, your scrap metal will be off your hands in no time! 1. Simply schedule your scrap metal appointment online or by calling 1-800-468-5865. 2. Our friendly, uniformed truck team will call you 15-30 minutes before your scheduled 2 hour window. 3. When we arrive, just point to the metals you want removed and we’ll provide you with an up-front, all-inclusive price. 4. Once you say the word, we’ll haul your scrap metal away from wherever it’s located and finish by tidying up the area. Most metal doesn't break down in landfills and burning can release harmful chemicals, making responsible disposal a must. We're well-versed in the proper eco-conscious methods for metal disposal, making our services a green alternative. Any refunds collected will be put back into our diversion efforts. When you want to do the right thing with your scrap metal, we're the perfect team for the job. Remember, all you have to do is point! 1-800-GOT-JUNK? offers metal recycling for your home or business, so scrap the pain of hauling that junk and call us today! We are fully insured and do all the heavy loading and lifting so you don‘t have to lift a finger. For peace of mind, your scrap metal will be recycled where possible. How do I properly dispose of scrap metal? For other metals and larger items, you can bring them to scrap yards in any quantity for recycling purposes. Of course, this can take up valuable time and requires a car or possibly even renting a truck if you need more space. If you don’t want to bring your metals to a recycling facility, let 1-800-GOT-JUNK? take care of it for you! We can pick up your scrap metal right from where it’s located—you won’t have to lift a finger. We’ll make sure it gets properly sorted and is taken to the appropriate recycling facilities. What is considered 'scrap metal'? Scrap metal is pretty much any product containing metal that can be recycled. This includes all types of metal and can come from a variety of sources. Scrap metal doesn’t always come from the things you expect, like construction debris and old cars. You can also find scrap metal in common household items such as frying pans, cooking tools, pop cans, tin cans, rebar, wires and pipes. Metal can also be found in electronic devices, but great care needs to be taken when breaking these down, since some items may contain hazardous chemicals and metals. At 1-800-GOT-JUNK?, we’re scrap metal removal experts and know just how to handle all your unwanted rubbish. We work with local recycling facilities to ensure proper disposal of both metal and non-metal components. What scrap metals can be recycled? Almost all metals can be recycled. In fact, most metals can be recycled over and over again without altering their properties. Some of most popular metals that are recycled are aluminum, brass, bronze, cast iron, copper, steel and tin. According to American Iron and Steel Institute (AISI), steel is the most recycled material on the planet. Scrap metal doesn’t always come from the sources you expect, like construction debris and old cars. You can also find scrap metal in common household items such as frying pans, cooking tools, pop cans, tin cans, rebar, wires and pipes. Metal can also be found in electronic devices, but great care needs to be taken when breaking these down, since some items may contain hazardous chemicals and metals. 1800-GOT-JUNK? can help you get rid of any unwanted scrap metal. Just give us a call—we’ll get it out of your way in no time and ensure it gets recycled or disposed of properly. Why should we recycle scrap metal? It’s quite expensive to mine and produce new metals, but the environmental cost is even higher. We know that mining causes damage to the environment, but now that it’s also becoming harder to access places with rich sources of metals, the methods of mining are becoming more invasive. There’s also a huge amount of energy required to obtain these new sources of metal. Recycling is a much more efficient way to produce metals needed for manufacturing. It uses less energy than sourcing new materials, while allowing us to preserve natural resources. It also helps to reduce garbage sent to landfills, and slows down the consumption of natural resources. Recycling is important to us at 1800-GOT-JUNK?. 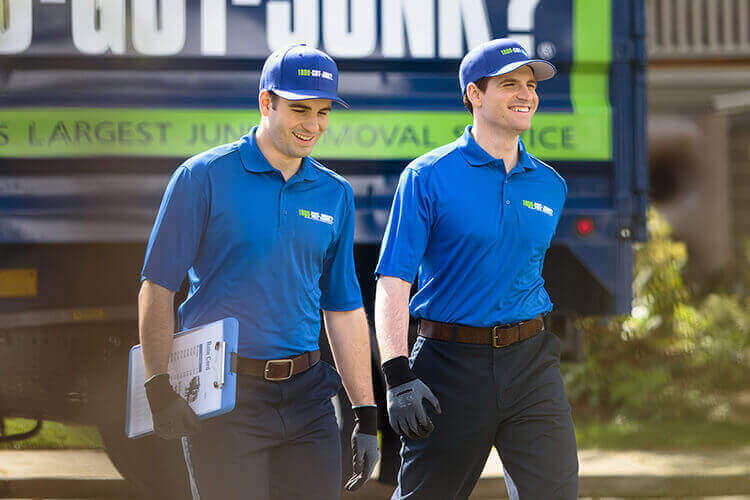 When you trust us with your junk removal, you can be sure that everything is being handled in the proper way. We work with local facilities to ensure metals are properly sorted and recycled where possible. How do you dispose of unwanted scrap metal? For other metals and larger items, you can bring them to scrap yards in any quantity for recycling purposes. Of course, this can take up valuable time and requires a car or possibly even renting a truck if you need more space. If you don’t want to bring your metals to a recycling facility, let 1800-GOT-JUNK? take care of it for you! We can pick up your scrap metal right from where it’s located—you won’t have to lift a finger. We’ll make sure it gets properly sorted and is taken to the appropriate recycling facilities. Recycling helps to reduce garbage sent to landfills, it slows down the consumption of natural resources and less energy is exerted in recycling production than new metal production. If you’ve got scrap metal you need to get rid of, call 1-800-GOT-JUNK?. We work hard to ensure that we keep all types of junk out of the landfill and work with recycling facilities to ensure scrap metal doesn’t go to waste. Learn more about What We Do and the 1-800-GOT-JUNK? Environmental Vision.